Did anyone else see the commentator's purple suit? WTF? Don't they have a PR department or someone to tell him that is a BIG NO NO fashion-wise? What's next? Pink suit? Green Suit? He's the Craig Sager of the East, lol. happy new year all, any working links for the game? 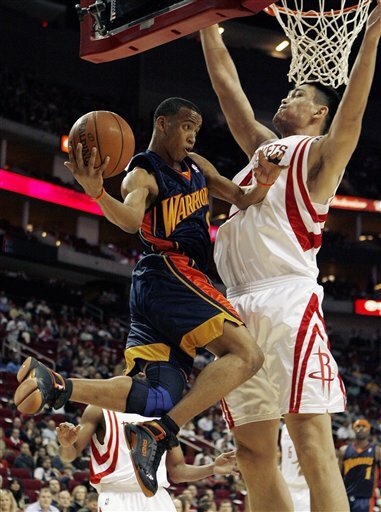 The best thing that happened in this game was Yao geting in foul trouble and sitting, that's when the Rockets took the lead. 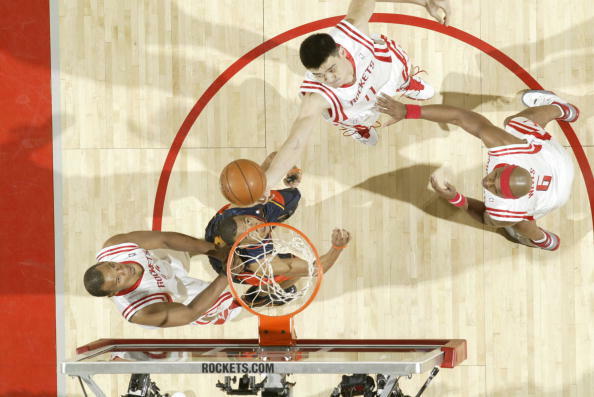 For some reason, they tried to get it into Yao in the 4th, with Harrington effectively fronting him, the offense stagnates, clock runs down and Rockets are forced to take a contested shot. They tried this on several sequences in the 4th and allowed the Warriors to pull away. This has not worked in the JVG era, so why keep trying it?! Very disappointing, Ws without their coach after Nelson was tossed in the 2nd! Rockets had an 11 point lead with Yao on the bench, but they tried establish him in the 4th and let the Ws run away with it! 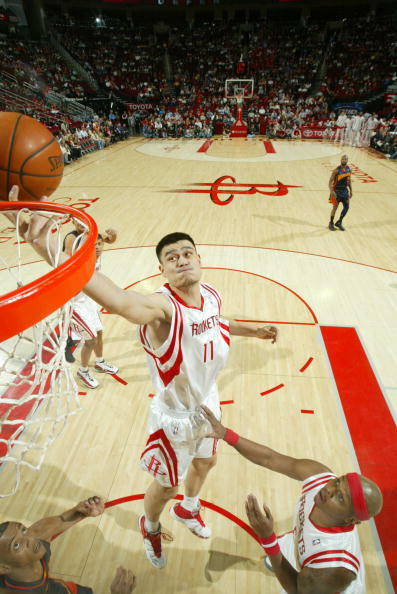 Rockets could not get a basket over 4 minutes into the 4th because they kept trying to pound it into Yao! Yao is such a liabilty against the Ws. Either use him on high screens, pick and rolls, hit outside jumpers(if he actually make them ), or just rebound and easy putbacks. Trying to post him up with Harrington fronting him and another defender ready for the lob pass, has not worked and isn't gonna work! Offense stagnates, clock runs down and rockets are forced to chuck up a bad shot! It might be not a bad thing to lose the game. Rockets got a little bit carried away when they had the lead. They became careless. When one Warrior had a small issue in the second quarter, their coach told him right away. I can understand how dissappointed Rockets will be tonight. Kudos to their efforts. They have a long way to go, a long journey for everyone of them. They need to compete night in and night out. BTW, did Baron Davis ever take acting classes? His kneeing down around Yao made me laughing for about 2 minutes. The referee could not help from laughing either... Good memory from 2007. It is about execution. When Rockets had the lead, they wanted to play like Warriors, while Warriros went inside. They chugged along patiently, and then started the firework when Rockets completely forgot about their outside shooting. For one moment, Rockets felt like that they are a better running team than Warriors. If only they had Warriors' decipline and confidence. There is no other team better deciplined than Warriors. 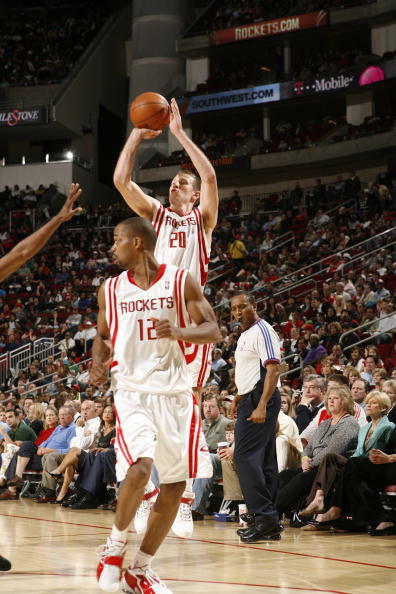 God, another loss, Yao only 16 and 9. The Rockets overall attempted 10 shots less than the Warriors, and got outrebounded by 13!!! 17 point loss, go ROX Battier and Hayes were absolutely useless, and probably Rafer's 22 points and massive ballhogging and horrible decision making had something to do with Yao's limited performance.